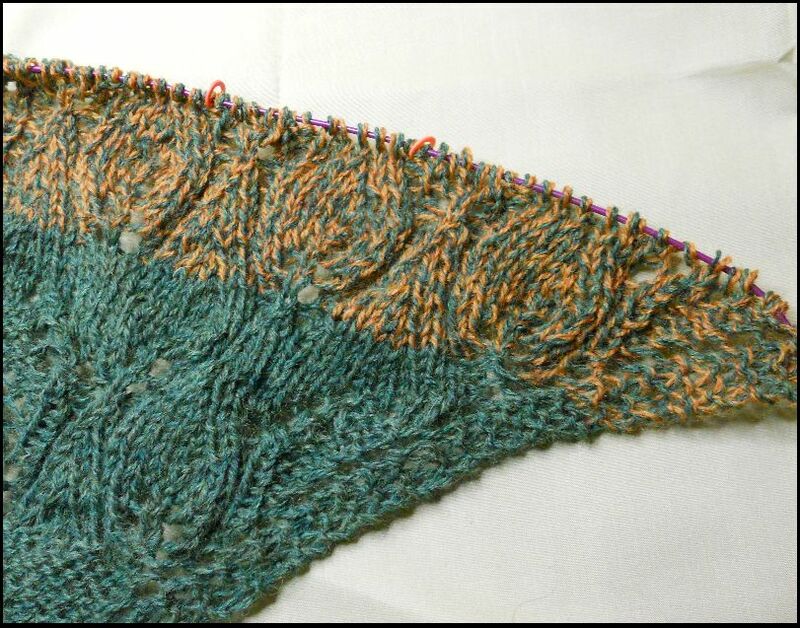 First, the Kilkenny Cable Shawl is finished! Once I block it, I'll post pictures and all of its finished stats. I've started a new project -- Knitpicks Fall/Winter Seasons Shawl (that's a Ravelry Link). The picture is of half of the beginning of the shawl. It begins with green and then switches to a green/persimmon combination for one pattern repeat. After that, I'll drop the green and pick up more persimmon. It's knit with two stands of Shadow lace yarn held together. I'm enjoying watching the leaves appear in the pattern. I haven't knit a lace yarn shawl before, so this is new. I have knit from charts (love charts!) and with the stitches necessary for a lace shawl, so this is kind of a next step. The Kavanagh one row scarf is still on the needles, as well.